With an eye towards constructed identity, I wonder what your thoughts are on George Takei and his internet persona. My understanding of his pop culture timeline is that after Star Trek ended, he wasn’t really in the spotlight for a few decades, but did work with local governments and advocacy organizations. Within the last ten years, though, his popularity has EXPLODED online. As of 6:15 PM tonight, his Facebook page has 6,165,710 likes, and his Twitter followers number above one million. And all of this from a 71-year old man! I know that a lot of Takei’s social media activism is to promote causes that are close to his heart, such as human and LGBT rights as well as Japanese-American cultural history. He definitely capitalizes on his popularity as Sulu on Star Trek as well, posting content relating to science fiction and geek culture. In my opinion, he successfully mixes the personal and professional to create a fascinating and often touching public image. I guess I was just curious to see how you think Mr. Takei fits into the spectrum of internet sharing and persona creation. 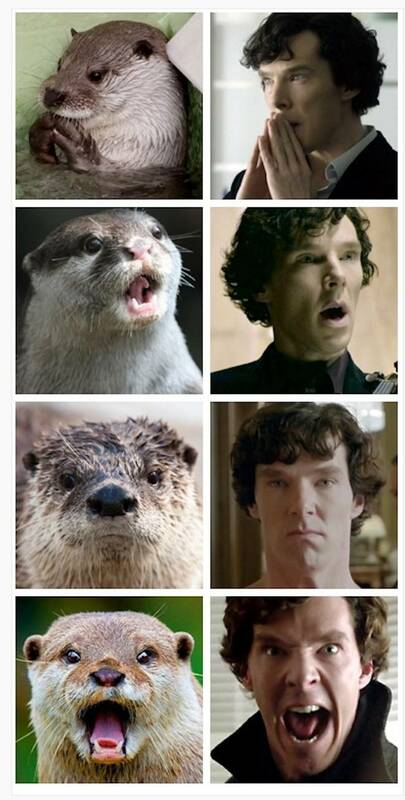 PS: Benedict Cumberbatch and otters made my entire day. Oddly, recently Uncle George (as his fans sometimes call him) posted a rather ominous message to his Facebook fans, directing them to his organizations’ and life partner’s facebook and twitter accounts for when his fame “inevitably winds down”. When it comes to George Takei, not only does he call attention to his unusual path to fame and its timeline, but the unusually constructed, networked, and ultimately temporal nature of influence on the internet. After all, he’s constructed this identity as everyone’s slightly dirty Uncle with a love of puns, when prior to this he was known for his humor, gravitas (and masculinity while fencing) and his ability to fly a starship. I also found that George Takei was one of the first people that came to my mind when reading Petra’s post. I think what is so remarkable about him is his mixture of comedy and activism. I’m sure that he has many fans who “like” and “follow” him simply because of his activist work, but I would guess that the vast majority of his fans see him as a source of humorous material. Yet this humorous material is usually accompanied by comments/quips that refer back to his activist side. In this way, he is using humorous picture sharing to not only craft his identity, but also to further his cause. “By reading [Gaiman’s blog] sporadically, am I part of the “court circle” of Gaiman fans, receiving and recirculating his witty missives? Does that group still count as a “coterie” (Standage 77) if it is available to the whole wide web? I love this question (and this post as a whole) because it gets at the transactional quality of online content as well as questions about curation and representation through associating with famous/infamous people. Part of what felt somewhat familiar when reading Standage’s section on the Devonshire MS as well as social media’s impact on courtlife is how followers of famous individuals crave affirmation from the popular person: there are fans who plead for retweets, followers who dream of being refollowed by their idols. We want to be seen adding value to Neil Gaiman’s or George Takai’s or Anne Lamott’s or whoever else’s online curated presence. One can sometimes hear the desperation of a “normal” person begging for a retweet or a follow, and I can imagine the social interaction in the English court having the same air of urgency and supplication. I have to agree with you that there is something inexplicably alluring about the possibility of being retweeted or refollowed by somebody famous. I know that as soon as I joined Twitter for this class, one of my immediate reactions (after following my current favorite musical artists) was a fierce desire for Lorde to follow me, which I expressed to some peers in the grad office and they promptly replied for me not to get my hopes up – that something like that rarely happens. But I’m wondering if it’s not just an impetus to, as you’ve said, “be seen adding value to [person x’s] online curated presence.” Perhaps it’s also a desire for personal and digital validation? Would that retweet mean that we, as internet-goers trying to establish ourselves, have achieved some sort of digital Holy Grail? Of course, I assume that famous figures like Takei and Gaiman have similar worries since their online selves are necessarily parts of their very public identities, but perhaps more deployed for the marketing of their “brands” than the average social media user. Interestingly, the fact that otters (and the significant otter) pun is proliferating on this class wordpress is another example–we are sharing in this a-dork-able pun in a way that’s actually identifying a group, highlighting how the court-commonplace book model has shifted to something slightly fluffier (pun alert) and also more horizontal and interactional (since we are all followers of each other). Michael, you were absolutely the inspiration for that particular reference: I clicked the hyperlinked text “significant other” in your post, half-worried by the thought that you had actually linked to a picture or webpage, but was instead amused to find myself directed to a collection of adorable aquatic mammals. I love the otters that look like Benedict Cumberbatch! And I suspect that the fact that we’re fretting over the differences between sharing Wyatt poems and otter pictures is indeed evidence that curating is indeed one of the ways we form and project a sense of self. As for following celebrities on Twitter—there’s a moment in Standage’s chapter on the rise of print in which he notes that the press allowed ordinary people to imagine themselves as participants “in a vast, distributed debate” (56). I think there’s something to that—that while we may not be peers or intimates of Takei or Gaiman, we can in some way participate in the same discourse as them.